I have a love hate relationship with fried eggs. For a while I’ve been more of an omelette, fritatta, or scramble person. 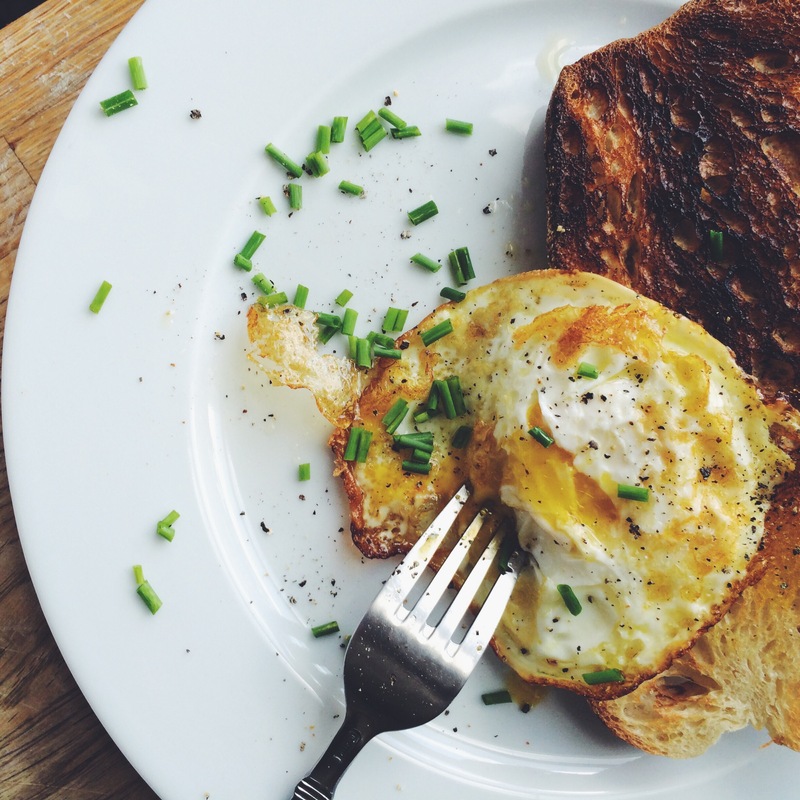 But theres just something about the simplicity of a simple fried egg with some cracked pepper over a piece of toast. Chopped herbs add a bit of freshness. Fry this the spanish way, with a bit of olive oil and a cast iron skillet and you’ll take this dish to new places. Heat about 1/4 inch of olive oil in a very small, heavy skillet. I used cast iron. Heat over medium-high heat until very hot; it should just be beginning to smoke. Crack an egg into a cup or mug. When the oil is hot enough, carefully slip the egg into the oil and immediately turn the heat down to medium-low. Spoon the hot oil over the egg as it cooks. Cook for no more than a minute and a half then take the pan off the heat and remove the egg with a slotted spoon. Top with cracked pepper and chives. Serve with a piece of great bread, toasted. Last week it occurred to me that I needed a waffle iron, Like couldn’t live without one for another minute. So off to Target and $18.99 later (yes I bought the cheapest one) thats how these waffles happened. The waffle-in-the-box route wasn’t going to work for me, I decided to try this overnight recipe which uses yeast to create light dough thats crispy on the outside. Warning: There is a lot of butter in this recipe, so you will want to take 4 spin classes after. The night before: Pour warm water in the bottom of a large bowl (allow room for dough to double in size while rising). Sprinkle yeast on top and let it dissolve and foam for 15 minutes. Stir in milk, butter, salt, sugar and flour. Cover bowl with plastic wrap and leave to rise overnight. The next morning, whisk in eggs and baking soda until smooth. Heat waffle iron and coat lightly with butter or oil. Ladle in 1/2 to 3/4-cup batter per waffle batch. The batter will be very thin and will spread a lot in the pan, so err on the side of underfilled until you figure out the right amount. Repeat with remaining batter. 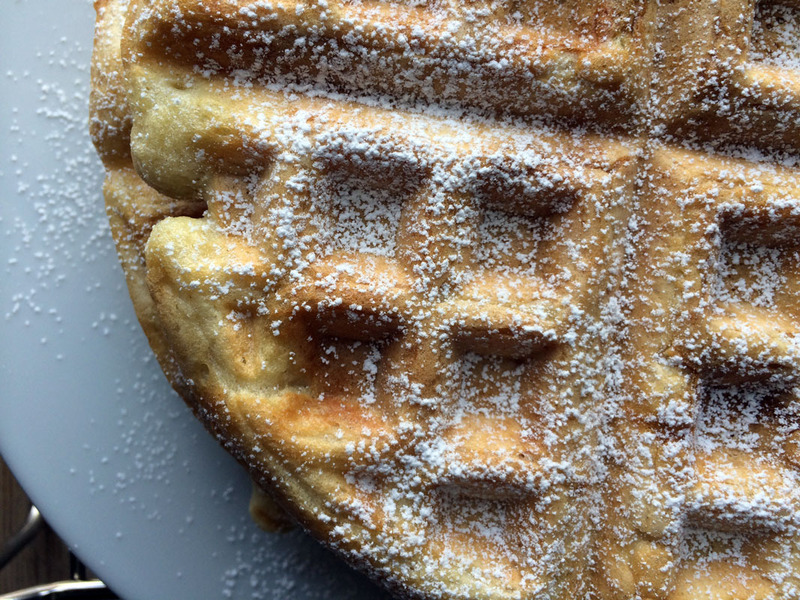 Serve immediately, or freeze and reheat in waffle iron or toaster later. NOTES: The recipe calls for this dough to be left out overnight, Ive left it out and kept it in the fridge overnight and I prefer the flavor when you refrigerate it. If you leave it out, it does take on a more complex flavor, so its up to you. I used 1/2 almond milk and 1/2 skim milk which worked well. And I might try with less butter next time. They taste great- but its ALOT of butter! I went to the grocery store to buy paper towels and left with three pints of blueberries. They were on sale. They’re in season. So thats how these happened. Im not going to say that baking muffins in the heat of July is the brightest idea, but thats my story. Preheat oven to 375 degrees. Line a muffin tin with paper liners or cooking spray. Beat butter and sugar together with an electric mixer until light and fluffy. Add egg and beat well, then add yogurt then lemon zest. Place flour, baking soda, baking powder and salt into a sifter and sift into the batter mixture. Mix until combined. Gently fold in the blueberries. The dough will be thick and sticky. Almost like a cookie dough. Scoop dough into muffin tin. I used a large tin (6 muffins) this recipe will yield 6 large muffins or 9 small muffins. The cups should be filled 3/4 of the way with batter. Bake for 30 mins or until a toothpick inserted into center of muffin comes out clean. Let cool on rack, serve with a pat of butter. NOTE: This is not a super rich typical blueberry muffin recipe, its not overly sweet and the greek yogurt gives it a lighter feel, the lemon zest adds a fresh element. If you’re looking for a lighter tasting recipe this is for you -however it is definitely not the buttery, sweet, coffee cake-like muffin recipe.